One of my bugbears is the misinterpretation and misuse of research studies. An excellent PhD Comic illustrates how a researcher’s tentative, qualified conclusion is stripped of doubt and injected with pop power by the media. Soon, it’s on everyone’s lips. Biologist Richard Dawkins called these phenomena of rapid and wide cultural diffusion memes. While many science-based memes are simply byproducts of curiosity-driven research (everyone knows what a Higg’s boson is now, right? ), others are either created or latched onto for purposes of selling something. Nowhere is science more twisted to suit marketing than nutrition. I remember reading the original paper in Science about the discovery of a compound in several edible plants that shrinks cancer tumours in mice. Oh, boy, I thought. This will be big. As a result of that study, everyone knows about resveratrol today, and it is the number one rationalization for drinking wine (since resveratrol is found in grapes). But did you know it’s also in peanuts and mulberries? No, I didn’t think you did. I’ll have another peanut butter sandwich with mulberry jam, please. Which brings me to chocolate milk. I’m a runner, and over the past few years I keep hearing runners telling other runners to drink chocolate milk. My latest iRun magazine lists chocolate milk as a super-food for runners. But I was skeptical. This had all the hallmarks of scientific research going meme, with no complaints I’m sure from dairy companies. I don’t know how you spend your day, but I look up original research papers. “Chocolate milk as a post-exercise recovery aid” was published in the peer-reviewed International Journal of Sport Nutrition and Exercise Metabolism in 2006. The study involved 9 male, healthy, highly trained cyclists. They first cycled at intervals of 90% and 50% of perceived maximal exertion (2 min each), with the hard interval progressively stepped down. They kept going until they couldn’t maintain their cycling cadence because of glycogen depletion, about 40 min. They were given recovery drinks right after the exercise and 2 h later. After 4 h loafing around the lab, they got back on the bike and cycled at 70% of their VO2 max until exhaustion, an average of 40 min. The drinks tested were low-fat chocolate milk, Gatorade and Endurox. What the researchers looked at was how long the athletes could exercise and how much work (in physics terms) they could do in the second cycling trial. That is, which drink worked best to restore their energy? The results showed that the athletes who drank chocolate milk could do more work than athletes drinking Gatorade (relative numbers only given ~sigh~, but it looks from a graph like about 30 kJ difference) and much more than athletes drinking Endurox (200 kJ). The athletes who drank Gatorade cycled the longest before becoming exhausted, but on average just a few minutes more than those who drank chocolate milk. Both drinks added an average 13 minutes more to the time before exhaustion compared with the Endurox. So, doesn’t that make chocolate milk good? Sure, in highly trained athletes exercising to exhaustion, whose glycogen is depleted and needs to be restored to do the next tough bout. According to the authors, the reason chocolate milk works so well is that it restores fluid levels and glycogen, through carbohydrates. It should also be noted that milk contains plenty of protein and vitamins, which may help account for its value. But here’s the catch: for most of us, chocolate milk has the same nutritional value as regular milk but with two added items – fat and sugar. These athletes drank low-fat chocolate milk to avoid the fat, and the carbohydrates they were getting were from sugar. 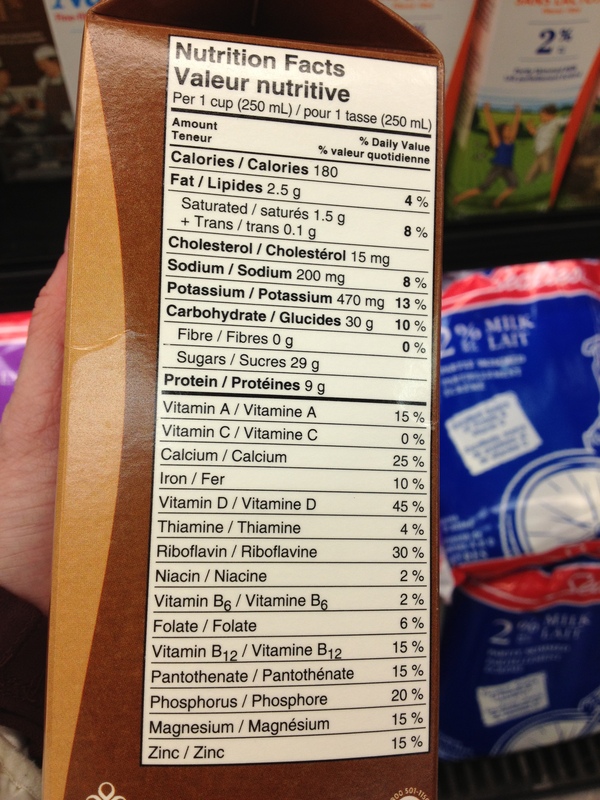 I went down to my local store and photographed the nutritional information for regular and chocolate milk. Of course, I hang out at a healthy food store with many organic and alternative products. They stocked the low-fat chocolate milk so, if you read closely, you’ll see the chocolate milk had the same fat content as regular milk. But it had lots of sugar. 29 g per 250 mL compared with 11 g per 250 mL for regular milk. Athletes usually drink about 500 mL to recover, so they would get 58 g sugar, rather than 22 g from regular milk. Multiply that by the number of times an athlete would drink a recovery beverage during the week, and it’s getting up there. For the average recreational runner, who may be trying to eat healthy and watch his or her weight, it is really not good to consume extra fat and sugar. You don’t need the extra carbohydrates unless you are exercising again in a few hours; those are only for endurance athletes or athletes in high-performance training. 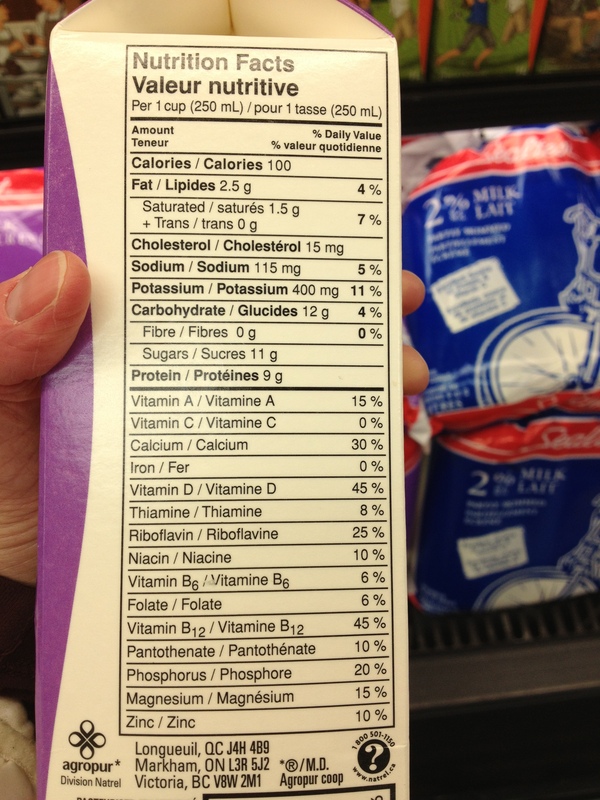 If you want a really good recovery drink, low-fat milk has protein and fluids. The moral of the story: studies in one group (high-performance athletes) should not be generalized to other groups (recreational runners); studies in one situation (repeated bouts of exhausting exercise) should not be generalized to other situations (recreational exercise). Oh, there is one use for chocolate milk: getting children who don’t like milk to drink it for the value of the other nutrients. But you’re all grown up now, aren’t you?